New challenges face the climate science community, including the need to provide skilful and reliable regional climate predictions from months to decades ahead. On regional scales, unlike the global mean, it is the dynamics as much as the thermodynamics that determines climate. The SPARC community includes leading atmospheric dynamicists who, as the focus on stratosphere-troposphere interaction has increased, have increasingly turned their attention to surface and tropospheric climate. SPARC scientists and others in the WCRP community have the atmospheric dynamics expertise to better understand tropospheric climate variability and near-term climate predictions. More. Changes in the chemical composition of the troposphere and stratosphere are critical factors determining radiative forcing and decadal-scale climate change. 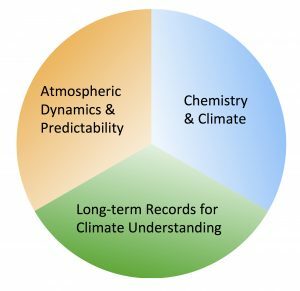 Understanding the interactive role of atmospheric chemistry in the climate system demands both new and continuing observations along with the development and validation of chemistry-climate models. Three-way coupling between chemical, dynamical, and radiative processes could have important effects on climate, including modulation of climate sensitivity. SPARC promotes a holistic view of the effect of these concurrent changes in order to understand the implications for climate. In addition, SPARC has an identifiable role to play in better understanding the emissions of the gases covered by the Montreal Protocol. More. SPARC has a well-established history of assessing the quality and utility of long-term climate records of temperature, water vapour, ozone, and aerosols. SPARC promotes the creation, analysis, and interpretation of climate data records (CDRs) of a range of essential climate variables (ECVs), including temperature, water vapour, ozone, and aerosols. In particular, this research provides support to WMO/UNEP scientific assessments of ozone depletion and IPCC assessments of the physical science basis of climate change. Ozone CDRs are not only essential for assessing the effectiveness of the Montreal Protocol but are also needed for prescribing forcings in climate model simulations without stratospheric chemistry. SPARC promotes activities to guide construction, analysis, and interpretation of CDRs that require international cooperation. For example, merging ground-based, balloon, aircraft, and space-based measurements and accounting for the spatial and temporal sampling characteristics of each measurement type. More. Please remember to send us a quick email with your feedback to gro.e1555870956tamil1555870956c-cra1555870956ps@ec1555870956iffo 1555870956. Thanks!